Just want to say that it is the work of SoV, C3V, and C3G that keeps me coming back to this site and it is that work that also drives me to support the site annually. Thank you for saying so, PJ. I can't imagine a better way to show your appreciation. An O'sixer and a Michigander. Nice! We’ve already got Seleena in the “35-point Hybrid Cat Person that’s hard to pin down” category, so how does this offering for Aquilla fare in comparison? There’s a straight-up comparison you can do here with Seleena: both have 3 life and 2 attack, and are Hybrids. Both have powers that boost their attack. Seleena has range, Maltis is fast and maneuverable. Definitely not breaking the game with the low stat line, which matches the low point cost. The miniature is dynamic, and the powers accurately reflect that. Maltis Tez certainly looks capable of jumping in and out of engagements for quick strikes. But in a nice show of restraint, the stats and powers seem to reflect the low power level you’d expect from such a miniature. Strategic Repositioning is a novel power, and has interesting uses. First Assault is a nice re-use here. Designing a high-speed, low-cost unit that has enough attack power to be useful is difficult, but this is a power set that can combine those without breaking the unit. Maltis Tez is often filler. That’s okay. He(? )She still has some uses, and fits nicely into some armies. Scout synergies make him interesting to play with the Venoc Warlord. With 9 move, Maltiz can grab glyphs quite quickly. Even glyphs that are 10 spaces away can be grabbed with 9 move, a first assault of 5 dice (assuming height), and a strategic repositioning onto the glyph. Holding the glyph is often worth those 35 points, and if not, there’s a chance Maltis can take a well-timed Order Marker and go play clean-up at the end. Hybrid synergies make you consider the Werewolf Lord. This works okay at the beginning of the game, as a few Moon Frenzies can get Maltis into the action. But this doesn’t work with the WWL’s best army (Wolves of Badru), and Maltis often doesn’t get time to shine before Lycanthropy comes into play, often with better, more disruptive options. By far the most effective I found Maltis to be was with the Teeth of the Makwa. As a scout, heshe can take turns at the beginning of the game (glyph grabbing, probably), while your Makwa develop. Played like this, heshe might only get one attack or so in the game, but that’s usually worth it to advance development and grab glyphs at the same time. 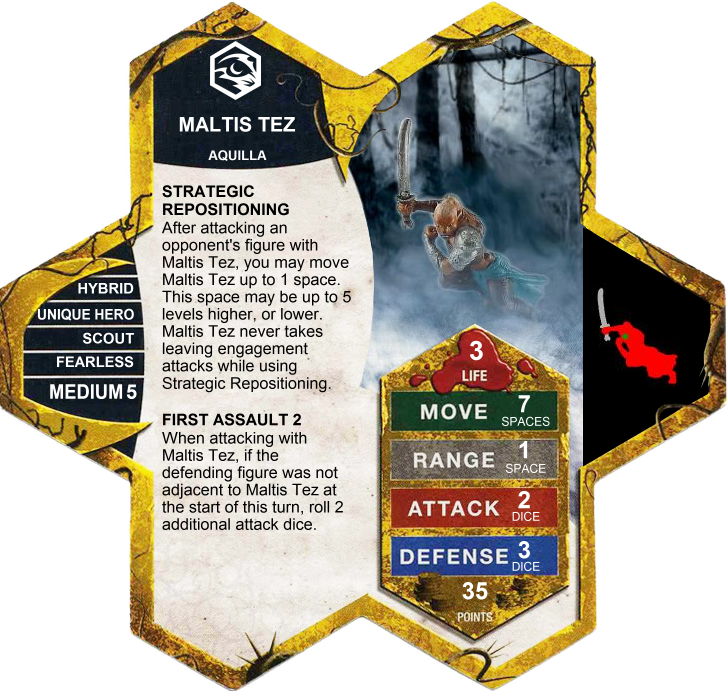 Maltis Tez has a few other tricks, like being able to hop off of a glyph to attack and hop back on in the same turn, or taking over an opponent’s position after a kill to provide blockage. But a lot of the time, none of this comes into play. Maltis Tez often falls flat. That’s okay, though. He'sShe's only 35 points. Maltis Tez upholds the iron triangle of sculpt/theme/mechanics. HeHhe has enough of a dynamic design to warrant inclusion into the right army, although heshe doesn’t have so much punch that heshe overwhelms hisher low point cost. Last edited by superfrog; January 4th, 2018 at 08:54 AM. Maltis Tez was originally male,(and an Elf following Ullar) and used a modified combo of Finn and Syvarris. That figure obviously wouldn't work for the SoV, so I found the current figure, which I liked a lot. The current figure's Sculpt is female, thus Maltis Tez is Female. I enjoyed Maltis in my playtests the Most with the Makwa as well. I love both the balance and lore of Heroscape. The collective armies of each Valkyrie general have their own flavor, strengths and weaknesses, and each army forms a fun and coherent whole (usually). In spite of this, I believe that every general should share something: their own 10-point unique hero. So last year I set about working on a 10-point unique hero for Jandar. I submitted Johann Graybeard to the SoV workshop in August and received mostly positive feedback. I made changes using the suggestions from the workshop participants and I feel that he is more solid now. I play tested Johann 20 times prior to submitting to the workshop. I and others have have now play tested him 20 times in his current iteration. I think he's ready to be evaluated. I hope that through this process, Johann Graybeard will eventually receive the SoV moniker. Bio: "Tell ‘Johann Graybeard's last stand,’" an elderly woman requested. Karl nodded as he stood in the middle of the circle of villagers who surrounded him. The story of Johann's last stand would be a fitting end to the evening of telling. The villagers nodded to each other. “Ja. That was Johann,” they said. “Another group stopped, but they weren’t like the others. They were brigands, intent on raiding while the men were still away. Two wore the uniform of the king’s soldiers, but they were no different from the other bandits – course, demanding, and greedy. They started threatening Frau Schmidt, our good village matron, after she refused their demands for money and goods.” Karl paused again long enough for the people to boo and curse the brigands’ memory. Some cheered Frau Schmidt’s memory instead. The villagers all nodded, “Ja. He vanished.” Although the village had held a funeral for Johann Graybeard after the men returned from the war, they lacked a body to bury. Creativity: Johann strikes a balance between fitting within the lore of Heroscape, and being unique. Like many unique units in Jandar’s army, Johann Graybeard is a human fighter who hails from Earth. He is a valiant warrior who fought for good causes before being mortally wounded and summoned to Valhalla. Although Johann Graybeard fits readily within Jandar’s army, he also possesses some unique aspects. Most notably, he is older, with his age being worked into the mechanics of his card. And although Johann is old, he still has some fight in him. Johann Graybeard is also from a culture that hadn’t really been used before in Heroscape (Germanic). I like the idea of Jandar drafting a grizzled peasant warrior after he fell in battle valiantly defending his people. Accessibility: The figure used for Johann Graybeard is a Pathfinder Battles figure from the Crown of Fangs set. Its model name is “Emperor's Thug #05”. There are over 100+ figures available across multiple outlets. Most sources sell him for less than $5. Balance: Johann is a useful, though not dominating, 10-point filler. I submitted him to the SoV workshop in August and received mostly positive feedback. I made changes using the suggestions from the workshop participants and I feel that he is more solid now. Specifically, I simplified his powers and lowered his move. Others and I have play-tested Johann Graybeard extensively (20 time prior to the SoV workshop and 20 times following the workshop) both in real games and in “end-of-game” scenarios. We tested him both in valiant and non-valiant builds and in Jandar-only and mixed armies. In some of the tests, Johann Graybeard could take his points worth (or more than that), but he had to be played thoughtfully to do so. He won’t automatically take his points. I used Johann Graybeard successfully in different ways. I used him in multiple games as a figure to tie down my opponents’ figures giving me more time to position/use my more important units. I used him to intercept an assassin (Siiv) who was heading toward my cleanup unit (Heirloom). He has cut a head off a Fen Hydra. He destroyed a pair of Warriors of Ashra, bypassing their defensive ability. But his biggest moment of glory was surging out of the start zone on Order Marker 3, knocking off a nearly-dead Tandros Kreel, taking the initiative for the next round and putting two wounds on Siege while Siege was shield stunned. While moments like these were rare, they were fun and exciting when they occurred! Alternatively, like any other figure, especially fillers, he can fall flat on his face. I tried him as a “Theracus bomb” to see if he would be able to unduly influence the game if he got into an opponent’s start zone early. That attempt failed miserably. My brother once chased down Me-Burq-Sa, in an attempt to give the warlord a taste of his own no-defense-dice medicine, but realized too late that Rushing Shield Stun only works on Small and Medium figures. In others, he died in or near the start zone having done nothing (I’m especially looking at you KMA, DW 9000, and Mok). And many games he never received an Order Marker due to being destroyed or by being part of an army that simply won without his help. In the “end-of-game” scenarios he lost most of the time against Isamu but won most of the time against Otonashi (my goal was not to create a new Isamu, but I was interested in seeing how he stacked up against the other 10-point figures). Whereas Isamu has the ability to one-shot Nilfheim, Johann won't be doing that without help from Taelord, Finn, height advantage, and a few glyphs. In short, Johann performs very much like a 10-point figure should (and did) never “break” a game. Playability: As a valiant 10-point figure who follows Jandar, Johann Graybeard is certainly playable – especially in a generals’ format game or a valiant build. The lowest point figure Jandar has is Eldgrim (at 30 points). The lowest point valiant figure is Kyntela Gwyn (at 20 points), and she does not really add much value to the typical valiant build. There are other possibilities for Johann Graybeard beyond a Jandar/valiant build, especially if he is able to combine his Shield Stun ability with his Remember Youth’s Vigor ability. For example, Johann might make a great counter-pick to samurai units because activating his Rushing Shield Stun ability would prevent them from using counterstrike on him. He could also put the finishing hits on a wounded small/medium figure (e.g., Tandros Kreel as described above). If activated, his Rushing Shield Stun would also prevent other figures’ special defensive abilities from working such as Heirloom’s Warforged Resolve or the Gorillinator’s Tough ability. Fun: The fun in Johann Graybeard comes in trying to decide when to bring him out and to see whether the D20 is rolling in your favor or not. Where Isamu is a lot of fun because of his defensive D20 ability, Johann is a lot of fun with his offensive D20 ability. Is he best off waiting to the very end of the game and mopping up a few remaining squad figures or a wounded hero? Is it worth it to try and sneak him behind your opponent’s lines in the mid-to-late game and have him use Remember Youth’s Vigor to try to take out a key hero (e.g., a wounded Raelin or Marcus Decimus Gallus)? And, of course, does his shield stun work and allow you to potentially put a whopping three wound markers on an opposing figure? I personally find him to be a lot of fun, and the others who have playtested with him feel the same. Because I have to evaluate other peoples' written manuscripts as part of my professional life, I understand the time that it takes to do these types of reviews. I appreciate the judges' time and effort as they evaluate Johann Graybeard. I think he's ready to be evaluated. A strong submission, except I can't see the card itself. Permissions problem perhaps? I think it's just not there. Thanks for the quick pickup @Scytale . I was so excited to get this in that I forgot to add it. With all the things that people want to remember to put into a submission it's certainly easy to forget one or two of them. Though I think this is the first time someone forgot the card. A once-per-round stat boost and a useful but not quite reliable stun ability are decent for a filler unit. I'm not thrilled about making a Valiant filler, though; one of the few disadvantages of the 4th Mass is fitting them into awkward point totals. That's not quite a reason for me to downvote the old fellow, though. I'm torn. I like the mini, and I like the powers. But I don't think I like the mini and the powers at a 10-point level. For me, a 10-point figure has to have a little bit more of a "wow" factor to be worthy of inclusion in the game. This approaches that, but I don't think it quite gets there for me. Okay, I've read through the card a few more times. I think the shield stun is much more interesting (especially in combination with Recall Youth's Strength) than I thought on a first read. What's the mini and availability? Nevermind! Found it!